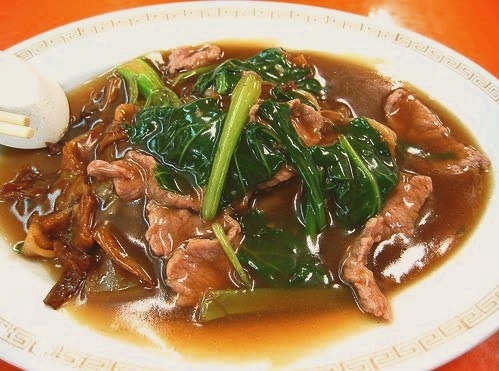 Singapore Beef Hor Fun (Cantonese) thick rice noodles cooked in a thick broth with beef and green vegetables. Marinate beef with all the seasoning ingredients (A) and set aside for 20-25 minutes. Heat wok with 1 tablespoon oil and swirl the wok around so that the oil coats the pan well. Use the spatula to remove any excess oil, then add in the rice noodles. Fry the noodles briskly in the hot wok for 1-2 minutes. Add the combined soy sauce mixture and fry the noodles well. Dish out and place on a serving platter. Heat a clean wok with 1 tablespoon oil and stir-fry mustard greens and beansprouts for 30-40 seconds. Remove and place around the noodles. Hi there, how much water is there in the second step? And how many servings does this recipe yield? Thanks! Looks yummy! hi, this beef hor fun recipe is for 3-4 pax. and oh yes, for the second step, add about 1 cup (250-300ml) of water for the sauce. the combination of water and flour in step B is to thicken the gravy. enjoy! tx for visiting!